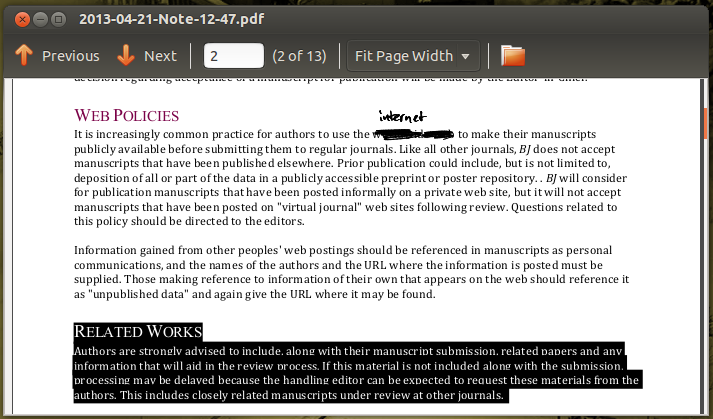 Is there a better way to redact a PDF? I had to print a couple of PDFs recently to send to someone, but I wanted to redact (black out) a couple small bits of text. The problem with this strategy is that the conversion process (from PDF to PNG or whatever other format) loses quality. I tried editing the PDF in gimp but it didn't work right away. Or, is there a trick to being able to edit PDFs in gimp? I was able to open a PDF file in Inkscape, draw a rectangle over a piece of text and print it out. Inkscape is a vector editor so no rasterization involved. Some fonts looked wrong though - probably because the document was created on Windows machine with fonts which are absent on mine. Note that any method that does not involve rasterization is only acceptable if you're going to print the redacted document on paper and not distribute it electronically, as the text still can be retrieved from under blackouts. Regarding "quality loss" when opening the page in Gimp: you can directly open a PDF file in Gimp. It will be rasterized in the process. The amount of quality loss in the process is a matter of resolution you choose when importing - 300 dpi should give you a very decent quality (the default is 100). 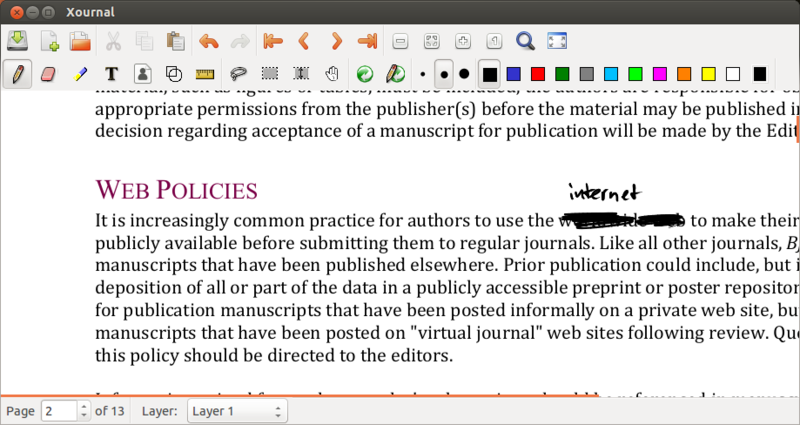 Basically what you are trying to do is highlight/annotate a PDF, but with some flexibility towards marker opacity and colour (you mentioned you don't need to censor/remove something, merely redact). Have you taken a look at answers here: How can I highlight or annotate PDFs? One of the highest rated answers recommends Xournal, which has not been mentioned here and would be my weapon of choice. It is a tool that allows you to make handwritten notes but has extra features allowing you to annotate a PDF. By default it'll save your annotations as a separate file but also allows you to export the annotated PDF as a new PDF. This should maintain the layout, fonts, etc. With Xournal you'd choose "Annotate PDF", then use a solid black marker to mask the parts you want to redact, and "Export to PDF". There are some stories on the internet suggesting that Xournal rasterises the text in the exported PDF (thanks for pointing this out, MHC). This does not seem to be true: with simple annotations, the text remains selectable and searchable and the file size does not increase by much (it increased from 205 kb to 220 kb in the example below). Open the pdf with Okular. Highlight the text you wish to redact. Right click the text, select properties, select the "Type" as "Highlight", press Ok.
Print the file to a pdf. I am redact a lot of PDF files everyday, so I spend a lot of time thinking how to do it the best way. 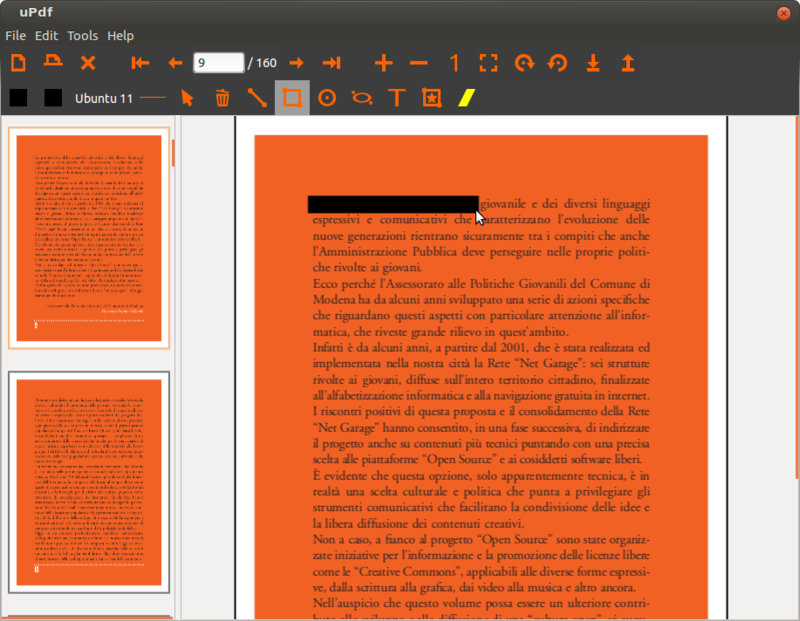 For me the best way is split PDF in 1-page PDF file, next to edit with GIMP, next to combine it. I don't use imagemagick on all files (I do not use at all), so I don't loss text-layer on all pages, but only on redacted. Do not load the whole PDF file at once, because it causes memory exhaustion. You can now enter split_pdf file.pdf to get a lot of PDF files. But, now you need edit all this files. You can do it with gimp original-filename-*.pdf. I suggest configure shortcut in GIMP (Main window->Edit-> Shortcut) to replace file (I use CTRL+R), blur filter (eg. CTRL+D), close file (eg. CTRL+W) and exit GIMP (eg.CTRL+Q). Remember to don't load in GIMP to many files at once, but GIMP as you about load after open, so you can use gimp original-filename-*.pdf on thousand files safe. Remember to close GIMP (CTRL+Q) after all redaction to continue script. In addiction it as me to open redacted files (I like read to check whether all) and as to upload to Scribd with my other script - scribd_up, so now I can redact a lot of PDF files very efficiently. Open the PDF with the free tool PDF-Xchange PDF Viewer. Black out the text to be redacted using black rectangles. Print. That will get you easy, high-quality "fake" redaction. To be able to import PDF files in to LibreOffice Draw you must first install the package libreoffice-pdfimport. Install it via the Ubuntu Software Center (libreoffice-pdfimport ) or via a terminal with sudo apt-get install libreoffice-pdfimport. Once you are finished editing, we did not save the changes, instead of that we print in to pdf file ... That seemed to work ok.
PDF Studio is a non-opensource and is software that requires purchasing. In terms of this question, from version 8 onwards it has a manual redaction feature. Users can select a text object and redact it. The content is removed from the PDF and replaced with a black rectangle. 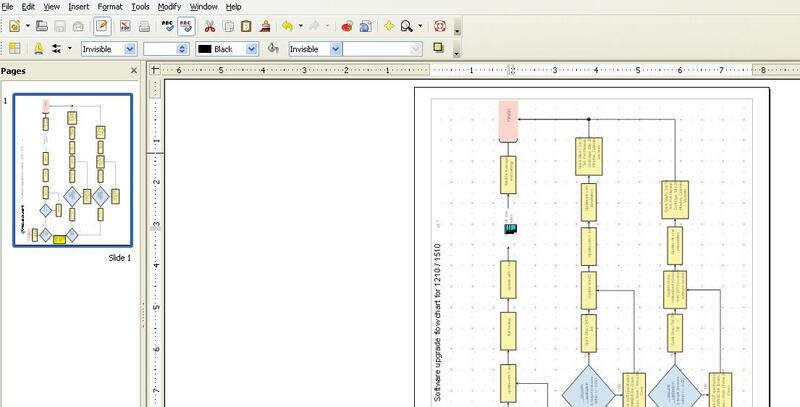 In version 9 coming third quarter 2013, redaction annotations and burning will be also available for images and shapes. Note 2: convert does not preserve the contents of forms you might have filled out. In order for it to not get lost you might want to print the document "to a file" in something like evince first (or in whatever application you filled out the form) and then rasterize it. The best way I have found to do this is to use http://www.pdfescape.com. You can annotate, add text and images, draw a "whiteout" rectangle around stuff you want to redact, and you can quickly download and save it. It also works really well with multi-page documents, which is something that lots of other solutions don't work well with. For example, if you open a multi-page document in Gimp or Inkscape, you will only be able to open one page at a time. The process is much faster in PDFescape. The whole process for me to redact a 2-page document takes less than a minute. If you don't want to remember the correct incantation for convert you can use pdf-redact-tools, a shell script automating the process of exploding a PDF into PNG images and merging them back together after redaction (using a tool of your choice e.g. gimp). It's conventiently apt-get installable. There are multiple editors for editing PDF documents directly, such as pdfedit, or converter it to other vector formats that might be better supported, such as pstoedit. However I wouldn't recommend the use of any of them as the risk of doing something stupid, like just painting over the text with black while leaving the vectors in place is to easy, thus making the redaction trivial to undo. Going the vector to bitmap route is the safest way, preferably the 1bit bitmap route, to avoid any potential issues with alpha channels or color differences that could leave the text readable. If possible you should always redact the original document and just flat out remove the info, not the paint on the PDF, as even the kerning and spacing of text around the redacted text can give it away. I add to the list: Krita. Had no quality loss, because when importing PDF you can define dpi (set it to 300, as @Sergey said). After editing hit "Export as PDF". Lastly, I find Krita more intuitive than Gimp, after having been a long time user of Photoshop. If using LibreOffice to create PDF file, open doc in LibreOffice , highlight text to be redacted, right click and select character, select Background and click on black. Export to PDF. Not the answer you're looking for? Browse other questions tagged pdf gimp imagemagick editing or ask your own question. How can I highlight or annotate PDFs? Is there a better pdf to text converter than pdftotext? What is the easiest way to rearrange pages in a PDF document? Is there a good way to extract font and color info from a PDF?